Where was I? Oh right, molasses cookies. Soft, crackly-topped, sugar coated, spicy molasses cookies. Something about the cinnamon, ginger, and other spices just seems perfectly suited for a holiday cookie. Before last year, I had never even attempted to make my own molasses cookies. I was too afraid they wouldn’t live up to the store bought cookies I’ve known and loved my whole life. Boy was I wrong! These cookies are better than the store bought versions, plus they make your house smell amazing while you’re baking them. What’s not to love? It’s important not to overbake these cookies to get the nice crackle top and keep them soft and chewy for days (if they last that long!). The cookies really won’t look done after 11-13 minutes, but they will firm up as the cool. If you bake them too long, they will be dry and crisp. If you don’t have raw sugar, you can use just granulated sugar to roll the cookies in before baking. I like the raw sugar because it gives them a little extra sparkle. Preheat oven to 375°F. Lightly grease 2 baking sheets, or line with Silpat mats. Whisk flour, baking soda, salt, and spices together in medium bowl until well combined; set aside. Cream butter, brown sugar, and 1/2 cup granulated sugar in an electric mixer until light and fluffy, about 3 minutes. Scrape sides of bowl with rubber spatula. Add egg, vanilla extract, and molasses, beating until incorporated. Scrape down sides of bowl. Add dry ingredients and beat at low speed just until it forms a dough – no longer than a minute or two. Measure remaining 1/4 cup granulated sugar and 1/4 cup of raw sugar into shallow bowl. Pinch off 2 tablespoons of dough, roll dough into a ball, and roll the ball in sugar until well coated. Repeat with the rest of the dough, placing the balls on the prepared baking sheets about 2 inches apart. Bake until edges are set and centers are still soft and puffy, about 11 to 13 minutes. If using to baking sheets, swap position of cookie sheets (top to bottom, front to back) halfway through baking. Cool cookies on baking sheets for 2 to 3 minutes before transferring to cooling racks with wide spatula. Oh goodness. These look so good. I’m making these ASAP. Your cookies look perfect! 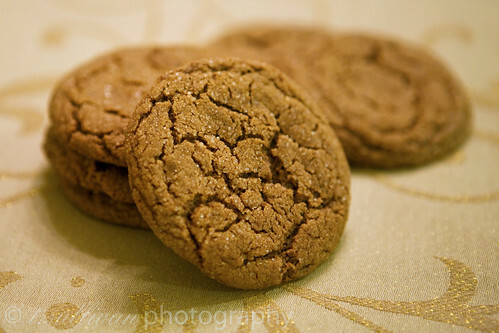 I have yet to try making molasses cookies, but this recipe looks like a great one. I made these two days ago, and they are still soft, chewy, and fantastic. Thanks for posting this recipe; I will be blogging about them soon.